Fokker set to work on a new aircraft, at Nieder-Walluf on the Rhine, with the help of boat-builder Jacob Goedecker, who also wanted to fly. It was on this second Spin that Fokker taught himself to fly on the Grosser Sand at Gonsenheim. At the beginning of May 1911 he flew a few curves, following them with a complete circle a few days later. On May 12th von Daurn finally got his money's worth when Fokker took him along as a passenger. Another goal was reached on May 16th, when Anthony Fokker obtained his pilot's licence. He had agreed with von Daum that the latter would become the owner of the aircraft as soon as Fokker had gained his licence. 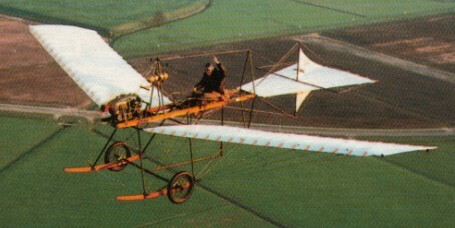 Von Daum wanted to start training right away, but Fokker tried to talk him out of it because he had received an invitation from his former home, Haarlem, to give a flying demonstration on the Queen's Birthday. There was money to be made, and he was afraid that von Daum would crash "his" aircraft again. However, von Daurn could not be dissuaded. After a reasonable start to his flying attempts he suddenly seemed to forget everything he had previously learned, and dived into the ground from a height of 10 metres. He shook the bits and pieces from him, and advised Fokker to "take his damned aircraft away, and fly to hell with it". Fokker purchased von Daum's share in the venture for 1200 Marks, and so became the owner of the wreckage and, more importantly, the 50 h.p. Argus engine. Meanwhile, a third Spin was being made by Goedecker, and on August 31, 1911 Fokker gave his first flying demonstration over Haarlem. The military version of the Spin was called the M.I. The initial version was the A-1912; the later B-1912 had a 100 hp engine, and a few others were fitted with 70 hp Renaults. Engine: One 50 hp Argus four- cylinder in-line. Wing span: 36 ft 1 in (11.00 m). Length: 25 ft 5 in (7,75 m). Wing area: 236.81 sq.ft (22.00 sq.m). Gross weight: 882 lb (400 kg). Max speed: 56 mph (90 km/h).